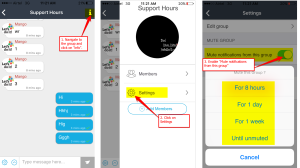 /Private & Group Chat /How to Mute a Team in Mangoapps? 1. Open MangoApps native app (Windows/Mac). 2. Click on ‘Messages’ tab and select the group that you would want to ‘Mute’. 3. Once the group window opens, click on “More Options/Three dots”. Please note that muting a team by following one of the above steps will mute the team on the “social bar” of MangoApps web application as well.